My mother, a former public high school English teacher, had this book on a shelf since she retired. The last time I was home I decided to put it back into circulation. It was well worth it! I have not read Eliot with any consistency but found him to be one of those sagacious, forward-looking thinkers who were warning us of what was coming. He reminds me of Lewis and Chesterton, always cutting across the grain of accepted thinking with surprising insight and clarity. 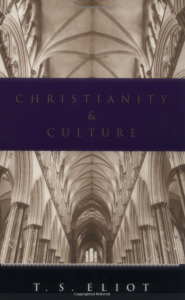 It was in this book (the title combining two older essays) that Eliot called culture the “incarnation of religion,” reaffirming my belief that no culture is morally neutral. It was a good find.